ORIGIN: Because of the time period and locations in which his story takes place, and the fact that his chief enemy was the shōgun Sakanoue no Tamuramaro, it is thought that Ōtakemaru may be a folkloric interpretation of Aterui, a chieftain of the Emishi people of northeastern Japan who waged a devastating campaign against the Yamato Japanese. His legend also serves as the basis of Aomori Prefecture’s famous Nebuta Matsuri, in which large floats depicting warriors defeating oni are parading through the streets. 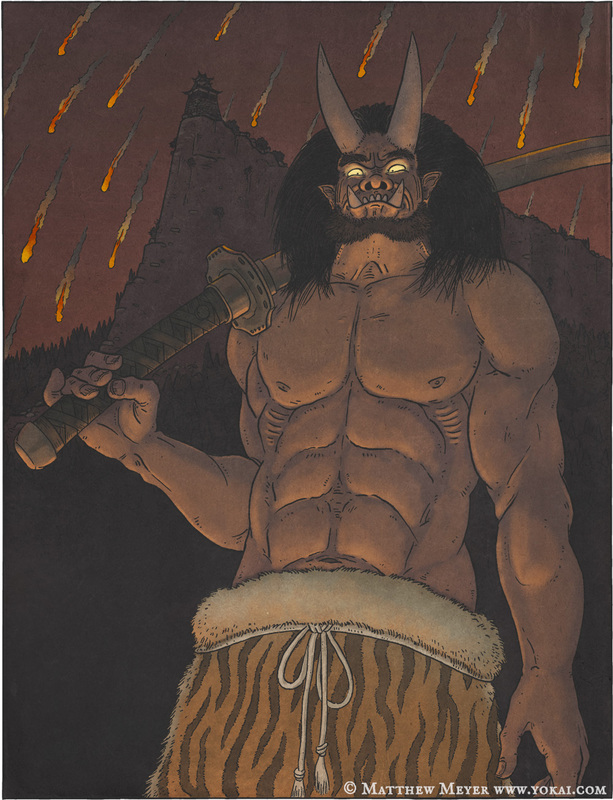 LEGENDS: Long ago an oni named Ōtakemaru terrorized travelers in the Suzuka Mountains and stole tributes intended for the emperor in Kyōto. The emperor commanded his shōgun, Sakanoue no Tamuramaro, to exterminate the demon. Tamuramaro raised an army of 30,000 horsemen and entered the Suzuka Mountains. However, Ōtakemaru was powerful, and using his black magic he summoned a great storm. He covered the mountains in black clouds, making it impossible to see. Rains and winds battered the army. Lightning crashed and fire rained down from the sky onto the army. For seven long years Tamuramaro and his men roamed the mountains in search of Ōtakemaru, but could not catch him. The Suzuka Mountains were home to a tennyo—a beautiful goddess named Suzuka Gozen. When Ōtakemaru saw her, he was enchanted by her beauty and became determined to spend a night in her company. He transformed himself into a beautiful young man, a noble of the court, and other disguises, and night after night traveled to Suzuka Gozen’s palace. But every time, his solicitations were denied by the goddess. Frustrated by his inability to find the Ōtakemaru’s whereabouts, Tamuramaro prayed to the gods and the buddhas to help him. That night, as he dozed off, he had a vision of an old man. “To defeat Ōtakemaru you must gain the help of Suzuka Gozen,” the old man told him. Tamuramaro sent his army of 30,000 horsemen back to Kyōto and climbed the Suzuka Mountains by himself. Deep in the mountains, he came upon a palace in which lived a beautiful woman. She invited him inside, and he spent the night with her. The woman told Tamuramaro, “I came down from heaven to help you defeat the demon who haunts these mountains. I will capture him for you.” Tamuramaro realized that this beautiful woman must be Suzuka Gozen. Suzuka Gozen led Tamuramaro through the mountains to show him the Ōtakemaru’s demon castle. She instructed him that Ōtakemaru could be defeated while he possesses the Sanmyō no ken (Kenmyōren, Daitōren, and Shōtōren: three holy swords of great power). Then they traveled back to her palace, where she laid her trap for the oni. The night, Ōtakemaru came to her again, disguised as usual as handsome young man to ask for her love. Suzuka Gozen invited him inside, and said to him: “A warrior named Tamuramaro is coming here to kill me. Please, lend me the Sanmyō no ken so that I may defend myself.” The oni gave her Daitōren, and Shōtōren to defend herself with, but kept Kenmyōren for himself. The following night Ōtakemaru came once again to Suzuka Gozen’s palace. Tamuramaro was waiting for him there. Ōtakemaru revealed his true form to the shōgun, transforming into a massive demon who stood over 10 meters tall, with eyes that shined like the sun and the moon. A terrible combat ensued. Heaven and earth shook with the fury of their battle. Ōtakemaru attacked Tamuramaro with sword and spear, but the shōgun was a holy warrior, protected by the thousand-armed Kannon, bodhisattva of mercy, and Bishamonten, god of war. Ōtakemaru split his body into thousands of oni, who charged at Tamuramaro. Tamuramaro took from his quiver a single holy arrow and fire it, The arrow split into one thousand arrows which in turn split into ten thousand more and impaled the oni in their faces, killing them. Just then, Ōtakemaru made a ferocious lunge at Tamuramaro. But the shōgun was faster, and he swung his blade Sohaya at the oni’s head, lopping it off. Tamuramaro brough the oni’s head back to Kyoto for the emperor to inspect. The emperor was so pleased with the shōgun that he granted him Iga Province as a reward. Tamuramaro returned to Iga, married Suzuka Gozen, and the two of them lived happily together for many years. Ōtakemaru’s reign of terror, however, was not over. His spirit traveled to India for a time, and eventually returned to Japan and haunted Kenmyōren. He was able to reform his body and once again became a kijin. He rebuilt his impregnable demon castle on Mount Iwate in Mutsu Province and once again he began to terrorize Japan. Tamuramaro and Suzuka Gozen traveled to Mutsu to meet their nemesis one more time and defeat him once and for all. 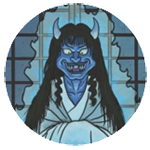 While Ōtakemaru was away from his castle, Tamuramaro snuck in through a secret back door that Suzuka Gozen had revealed to him in Ōtakemaru’s first demon castle. When Ōtakemaru returned, Tamuramaro was waiting for him. They did battle, and once again Tamuramaro cut Ōtakemaru’s head clean off. The oni’s head flew up into the air and landed upon Tamuramaro’s head and bit down hard. Fortunately, Tamuramaro was wearing two helmets. Though the demon head bit off and swallowed the first one, Tamuramaro was able to escape injury. Ōtakemaru’s head was once more taken back to Kyōto, where it was locked safely away in the treasury of Byōdōin. Do you like this site? Do you want to see even more yokai? Join yokai.com on Patreon to get new yokai every month! The Night Parade of One Hundred Demons and The Hour of Meeting Evil Spirits are available Amazon.com in paperback and Kindle formats.